Think chiles and what’s the first thing that comes to mind? Heat, right? We’re talking tongue-tingling, throat-scorching, mind-blowing hot. All you’ve got to do is check out a chile eating contest and you can see that when it comes to heat, there’s no pain, no gain. As we speak, growers around the world are busy coming up with new chile varieties that push the bounds of the Scoville index and promise us new ways to incinerate our taste buds. But guess what? It’s not all about heat. Sure, heat is great but the flavor you get from a chile is much more complex than that. Don’t believe me? Just take a great dried chile and give it a whiff. Depending on the variety you’ll pick up hints of berry, dried fruit, even chocolate. And a really good chile has a complexity that keeps you coming back for more. Take the Mulato chile. It hails from Mexico and is a dried Poblano. Ancho is a dried Poblano too, but the they come from different varieties. 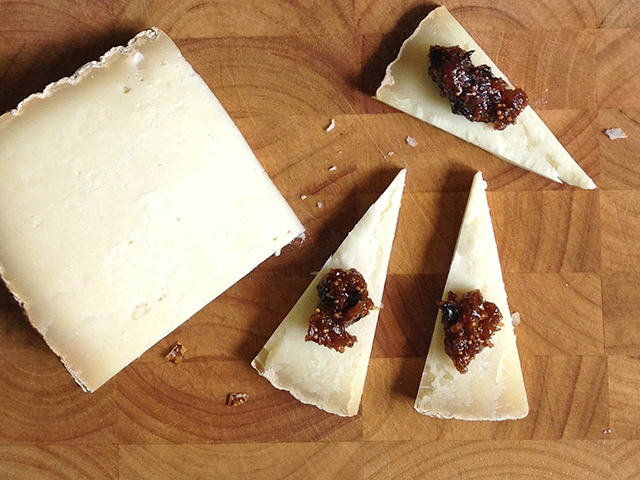 Mulato is a bit smokier than an Ancho with hints of cherry and tobacco. 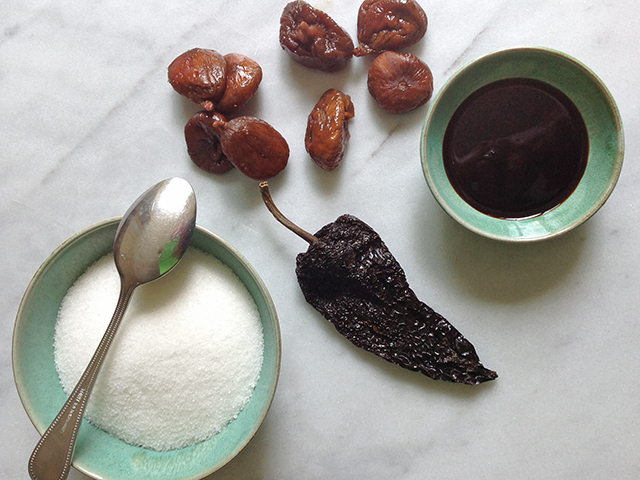 Along with it’s bro Ancho, and the Pasilla, it makes up the ‘Holy Trinity’ of chiles used to create a killer mole. Not too shabby is it? The Mulato is about 2-3” wide across the shoulders and 4-5” long with a medium thick skin. It’s darker than the Ancho – a dark brown almost black color. You’ll find it used in soups, stews and sauces. Is it super spicy? Is it going to tip the Scoville scale? Heck no. But it gives food a lovely warmth and depth – a heat that doesn’t whack you upside the head but instead wants to cuddle on the couch. And be honest, we could all use a cuddle couldn’t we? This is super-duper easy and most definitely delicious. I’ve used pre-soaked figs (for no other reason than that’s what my store had on hand) but regular dried figs are absolutely fine. I used Smyrna figs from Turkey but Black Mission figs would be yummy too. 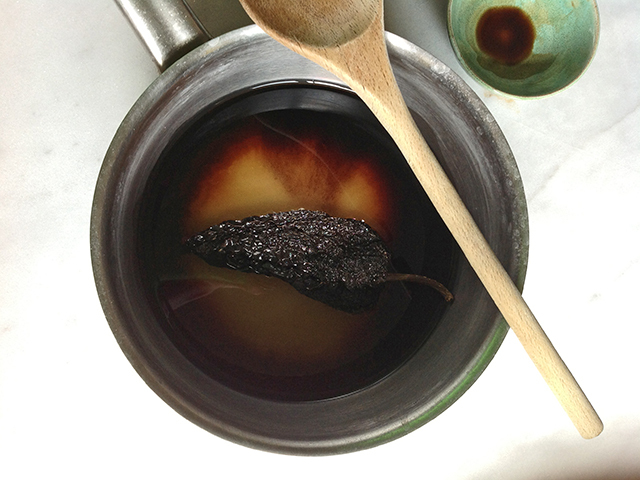 Place the water, sugar, balsamic vinegar, salt and chile in a saucepan. 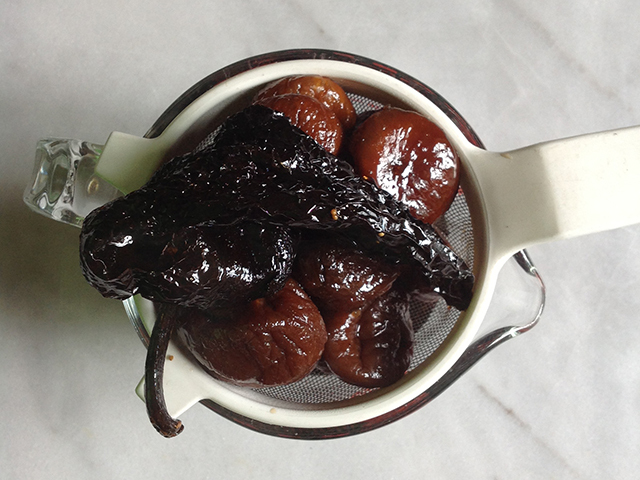 If you’re using dried figs add them now as well – if you’re using pre-soaked hold off. Bring the mixture to a boil, reduce the heat and cook until the chile and figs (if you’ve added) are soft but not mushy – about 8-10 minutes. If you’re using pre-soaked figs, add them in after about 7-8 minutes, once the chile has softened then cook for another few minutes. The liquid should be slightly thickened. Remove from the heat. When the chile is cool enough to handle, remove the stem but leave the seeds. 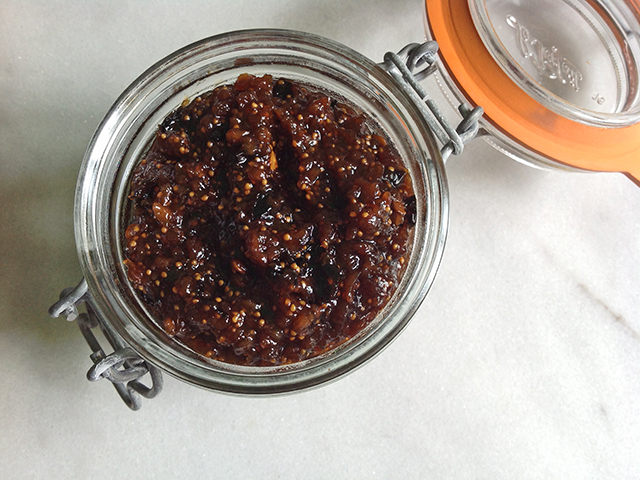 Strain the entire mixture and place the figs and chile in the small bowl of a food processor. Puree, adding enough of the liquid to form a rough paste. You can adjust the amount of liquid to suit your taste. If you have any of the liquid left, you can further reduce it and drizzle over ice cream or yogurt. 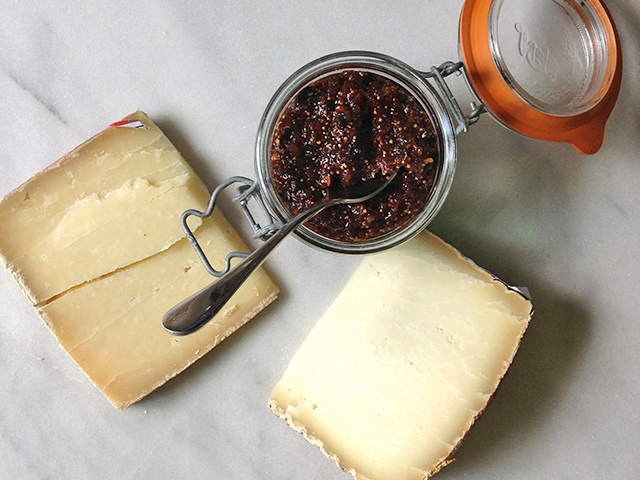 Place the jam in a clean jar and serve with bread or pecorino cheese. Refrigerate. Will keep for about a week. This entry was posted in Chile Portraits and tagged chile fig jam, holy chile trinity, mole, Mulato chiles by loschileros. Bookmark the permalink.